Hopping continents from last months South American feature, and taking a break from his accustomed stomping ground of Asian catfish, Heok Hee returns with insight into a catfish straight out of Africa. Catfishes encountered in the aquarium trade are generally either attractively coloured with a bold pattern of stripes and/or spots (such as many L-number loricariids) or an exceedingly dull uniform brown or grey. However, there are a number of catfishes with a colour pattern that can be described as neither of very dull nor very attractive, and one such catfish, the dwarf giraffe catfish (Anaspidoglanis macrostoma), is the subject of this month's write-up. 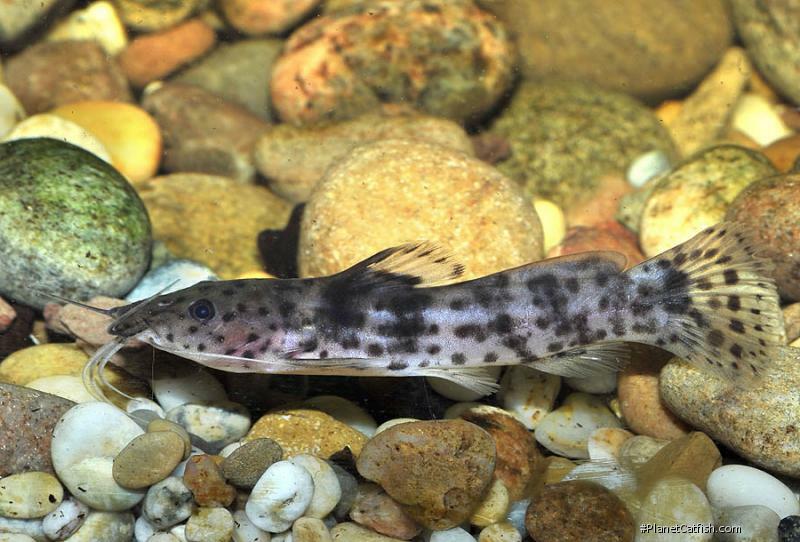 The dwarf giraffe catfish was formerly placed in the genus Parauchenoglanis, but was placed in a separate genus on the basis of distinct (mostly osteological) morphological differences. Because of the taxonomic history, the dwarf giraffe catfish has often been confused with Parauchenoglanis guttatus (which is very rarely imported for the aquarium trade, if at all). Like many other catfishes, dwarf giraffe cats are very shy and will spend most of the daylight hours hiding (although they can be coaxed out by food). The dwarf giraffe cat enjoys digging the substrate in search of food, like its bigger cousin, the giraffe catfish (Auchenoglanis occidentalis), so it is a good idea to make sure that any plants in the tank are potted (or otherwise well secured). Like many other catfishes, they are greedy eaters and have little trouble with most foods (including smaller tankmates if possible). They are not too particular about water conditions and will do well in mildly acid to mildly alkaline conditions. Although dwarf giraffe cats are reportedly territorial in small groups, they have been successfully maintained so in aquaria. The secret to maintaining them happy and harmonious is to provide enough hiding spaces for all so that they can mark out enough territory. Of course, the sizes that the fish can grow to usually means that it is practical to keep only one or two fish in the average home aquarium. Apart from fishes small enough to be eaten, they get along well with other fish (provided that there aren't too many bottom dwellers competing for hiding spaces in the tank). They feel right at home in a west African concept tank, together with fishes such as Synodontis, Alestes, Barbus, Ctenopoma, and Pelvicachrormis. Many catfishes featured as CoTMs usually have one (or more) of these features: attractive coloration, unusual shape, or an engaging personality. The dwarf giraffe cat can be said to have none of these, but continues to maintain a quiet, unassuming appeal among aquarists.